A Celebration of published authors of Netwest brought out over thirty members and guests who enjoyed a festive evening of food, wine and mingling with other writers. 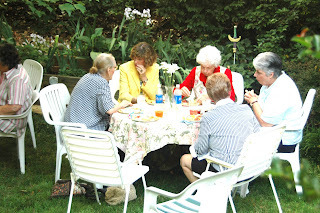 Michelle and Paul Keller opened their lovely home for a "garden party" set up under large trees in their back yard surrounded with flowers of all colors and kinds. Writers and poets from Towns County Georgia, Union County Georgia, Clay and Cherokee Counties in North Carolina applauded the success of Brenda Kay Ledford, Glenda Barrett, Jerry Hobbs, Shirley Uphouse, and Mary Ricketson who have published books in recent months. Other writers in the Netwest area have books out but the traveling distance prevented them from coming to the Celebration. Sam Hoffer, new Netwest member and food columnist for the Cherokee Scout newspaper brought one of her outstanding dishes. Another new member, Marjorie Hobkirk, a resident of Brasstown, was among the writers who attended. The consensus was that we need more opportunities to come together for socializing and getting to know each other outside our critique groups and readings.